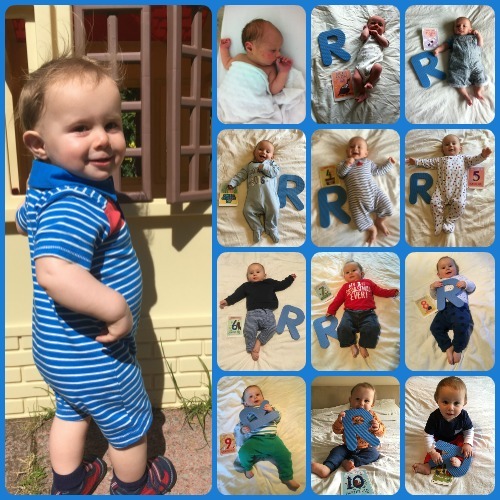 Baby R turned one last month but his birthday plans didn't quite go to plan! As with the post about Little Miss A's 4th Birthday, I'm late writing this but it's important to me to have a record for the kids to read in the future, so I'm writing it now. I love the photos that I took each month of him. They really do chart the amazing changes he's been through from dinky dot to little man. Baby R's birthday fell on a nursery day so off he went with a cake to share with his little friends. His first taste of chocolate cake and from the picture they sent me, he definitely enjoyed it! When I picked him up from nursery, they mentioned they'd spotted a couple of spots on him. Chicken pox had been doing the rounds of the nursery and Little Miss A had it a few weeks before. We thought maybe Baby R missed it, but these spots looked very suspicious. He actually only got a few more spots so not a full bout. I think it means he'll probably get it again in the future! We had a big family party planned on the Saturday with all of Mr MoaB's family. I'd done loads of party preparations for the theme of The Very Hungry Caterpillar and had bought tonnes of food for everyone. However, we couldn't risk infecting any of the relatives with chicken pox so we unfortunately had to cancel the whole thing. I was really upset at the time, but there was nothing we could do. So all we could do was have the party anyway, just with the 4 of us. Baby R really didn't mind. We had an awful lot of food to eat! In the end, Mr MoaB took a load of food to his work for his staff. I was so chuffed with all the party decorations I had put together and our dining room looked really good. 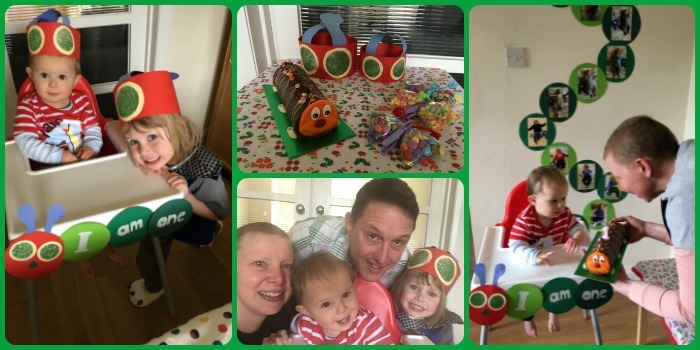 You can read more about Baby R's Hungry Caterpillar Party in this post. There was a mad dash to the supermarket to get a Birthday cake as Baby R's Great Aunt was making one for his party. I was just relieved the supermarket had a caterpillar one to fit our theme! Baby R chose his Birthday weekend to start walking! He'd taken a few tentative steps before then he just walked across the room and now there is no stopping him! It's such a milestone. He was just a week behind his sister in the walking stakes as she started a week before her 1st Birthday. Well done Little Boy! Baby R is such fantastic addition to our family. It's hard to remember a time when he wasn't part of it. He hasn't had it easy as we've been through a lot of really tough times over the last year. Through it all he can always be relied upon to provide a big smile and cheer us up. We're so proud of him and how he's developing so well.